An old friend of ESA, Comet 46P/Wirtanen, is crossing our skies this month. The comet nucleus is at the core of the brightest spot at the centre of the image, and the green diffuse cloud is its coma. The green colour is caused by molecules – mainly CN (cyanogen) and C2 (diatomic carbon) – that are ionised by sunlight as the comet approaches the Sun. A hint of the comet's tail is visible to the upper left; the diagonal stripes are star trails. A bright comet with a period of 5.5 years, 46P had been chosen in the 1990s as the target of ESA's Rosetta mission. However, a launch delay from 2003 to 2004 meant the spacecraft would not be able to rendezvous with that comet at its closest approach to the Sun in 2013, prompting the Rosetta team to select a new target, the now famed 67P/Churyumov­-Gerasimenko. 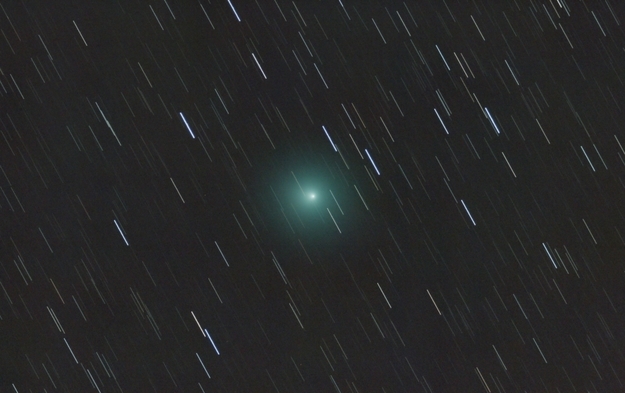 Comet 46P was at perihelion, the closest point to the Sun along its orbit, on 12 December, and kept moving towards our planet, reaching the closest distance to Earth on 16 December. Astronomers across the world – professional, student and amateur alike – have been observing the comet recently, and will keep doing so in coming weeks as it moves away from the Sun along its orbit. This image was taken by Wouter Van Reeven at ESA's European Space Astronomy Centre (ESAC) near Madrid, Spain, on 14 December 2018. It is a composite of 132 individual images, each with a 10 second exposure, using a William Optics ZS 71 ED (71 mm refractor) telescope and a Canon EOS 700D DSLR camera (ISO: 3200). The field of view spans 2.8 degrees × 1.8 degrees.